Episode 83 comes to us from SugarBeats. This dynamic duo comes in hot with almost 50 minutes of straightforward Glitch Hop bangers. The mix starts out with their own original tunes and then moves into some of the genres most sought after artists, including Au5 & Fractal, Mr.Bill, Circuit Bent, and Stickybuds- chopped and screwed with layers of vocal edits and acapellas to keep it feeling familiar and danceable the whole way through. 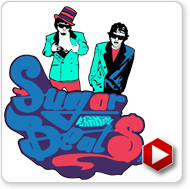 Here to bring you the candy coated, syrupy sounds your sweet tooth can't live without, SugarBeats is a collage of styles and flavors ranging from funk, soul, and jazz to hip hop and bass music. Born from a collaboration between producers Golden Toast and Badmath, SugarBeats is the culmination of years of skill sharpening and experimentation. This experimental element remains evident in the large range of styles between songs, as well as the quirky or unexpected twists and happy accidents that emerge from the songwriting process. Inspired by the notion that music should be fun for the body and nourishing for the soul, Toast and Badmath re-imagined the hip hop styles they developed during high school together into the bouncy, bass heavy funk that it is today.